Bhutan has a very different outlook on Development. With a population of less than one million and nestled in the eastern Himalayas, this small country has adopted the sustainable development approach of gross national happiness (GNH), a measure of wellbeing that differs markedly from traditional measures such as gross national product (GNP). While the country has faced international attention for embracing GNH, Bhutan’s economic measures in recent years speak for themselves. In the decade between 2005 and 2014, Bhutan’s annual average growth rate reached 7.6 per cent, the 16th highest of 135 countries. The proportion of the population in poverty (earning less than US$1.90 a day) fell from 25 per cent in 2003 to 2 per cent in 2012. The reduction of poverty was accompanied by an improvement in equality, as measured by the Gini index. During the same period, the index improved from 69 to 39 (0 shows perfect equality). What are the driving factors behind this impressive trilogy of sustained high growth, poverty reduction and equality? First, Bhutan has developed a solid development management system to realise its GNH principles. The formulation of GNH goes back to the early 1970s when King Druk Gyalpo declared that GNH rather than GNP should be the nation’s principal yardstick for measuring progress. GNH is a multi-dimensional development approach that seeks to achieve a harmonious balance between material wellbeing and the spiritual, emotional and cultural needs of the society. During the state-of-the-nation speech in July 2016, Bhutan Prime Minister Tshering Tobgay described GNH as ‘development with values’. In order to further realise GNH, the latest medium-term development strategy — the 11th five-year plan from 2013–2018 — elaborates on how to make GNH a reality. It does this through applying the GNH Index, introduced in 2008, and the GNH Policy Screening Tool, introduced in 2009. This means that Bhutan has to monitor the progress of GNH on a regular basis and new policies have to be aligned with GNH. Second, Bhutan’s development builds on a strong governance foundation. According to the 2015 Corruption Perception Index by Transparency International, Bhutan ranked 27th among 168 countries and far ahead of other South Asian countries. 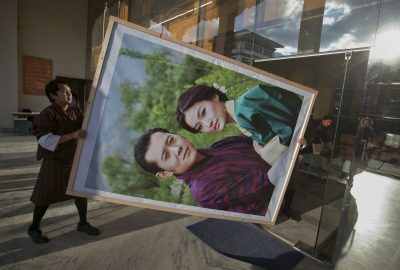 The World Bank’s Worldwide Governance Indicators in 2015 showed that Bhutan exceeded the average in four out of six dimensions of governance, including governance effectiveness, and political stability and absence of violence. The latter dimension demonstrates how the peaceful transition to a democratic constitutional monarchy has contributed to the country’s achievements. Third, Bhutan has made the best out of its endowments for development, especially its hydropower resources. Hydropower exports accounted for about a third of total goods exports, and the country’s generation capacity is forecast to double in a few years. The development of the hydropower Sector has been achieved with environmental sustainability. Forest area as a percentage of total land area now exceeds 70 per cent, well above the 60 per cent requirement of the constitution. The effective use of hydropower and maintaining forest coverage has enabled Bhutan to become the first carbon negative country, absorbing more carbon dioxide than it produces. But Bhutan also faces development challenges. In the past, the public sector (including the development of hydropower) has played the major role in economic development. The large scale of the sector relative to the size of the economy has brought large current account deficits — exceeding 25 per cent of GDP — and excess domestic demand. The hydropower sector is also not integrated well with the rest of the economy and has generated little employment. To maintain its trifecta of growth, equality and reduced poverty Bhutan must maintain macroeconomic stability. This can be done by reducing the current account deficit as well as obtaining stable sources through which to finance it, such as remittances and foreign direct investment. Given the small scale of Bhutan’s financial sector and that Bhutan’s currency is pegged to the Indian rupee, fiscal policy will have to play a key role in maintaining macroeconomic stability. Diversification is equally important for sustaining high growth and creating jobs. In Bhutan’s context, diversification means the development of the private and non-hydropower sectors. While the hydropower sector — part of the public sector — has played a key role in increasing the country’s GDP, it has limited job creation capacity. Addressing these challenges will likely play a key role in Bhutan’s 12th Five Year Plan, due to be released in 2018. Yoichiro Ishihara is a World Bank Resident Representative and Senior Country Economist for Bhutan.